Friends, I’m digging this one out of the archives for you all. I wrote this several years ago, and it got stolen and posted without attribution, but since my point stands (and stuff gets stolen when it’s worth stealing) and still applies, I’m resurrecting treatise on the “Lay ‘Er Down” myth, because really, this one has to stop. I once read a plea on some online forum a rider who was surprised by an SUV in a rotary and “had to lay ‘er down” in order “to avoid broadsiding” said SUV. Keep an eye out, they said–those jerks didn’t even stop. Come sit with me for a moment, and let’s think about that. The motorcycle did not make contact with the SUV. But the rider insisted that “laying the bike down” was the best course of action, and insisted that all of this was the fault of the SUV driver. I’m willing to accept that the SUV probably didn’t yield to the traffic already in the rotary per local law. Heck, that driver might have been toying with their phone instead of watching where they were going. 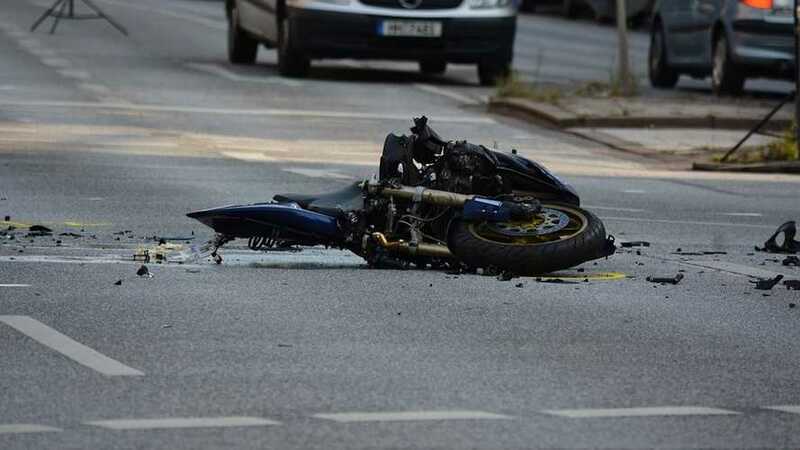 But the blame in this case falls squarely with the motorcyclist. The coefficient of friction of metal (and plastic) on pavement is quite a bit lower than that of rubber on pavement. That is, given similar momentum, a motorcycle will slide a lot farther when it is on its side, than it will upright on its tires with all of its brakes truly and properly engaged. So unless the brakes on the motorcycle were completely shot (not the SUV’s fault) or the tires were so old they had no grip left (I know, I’m reaching), or the SUV got very close to the rider (not bloody likely given the fact that there was no contact), the crash was entirely the motorcyclist’s fault, for not knowing how to brake. Let’s stop kidding ourselves, fellow motorcyclists. It does us an injustice. When we say “I had to lay ‘er down” we are saying we had to crash to avoid a crash. This makes approximately zero sense. In fact, when there is no contact you are worse off from an insurance/at-fault standpoint. When there is no contact, it is a single vehicle crash and you cannot sue anyone for damages. You cannot expertly throw a motorcycle to the pavement without some kind of training. Are local clubs holding “lay ‘er down” seminars on a sacrificial bike? Have they done this so often that they know where the bike, and they, will go, upon pavement contact? Mustn’t they be spending a ton of money on replacement riding gear and bike parts, or hospital bills for all that skin loss? Do yourself a favor, each and every rider. Hie thee to a deserted parking lot and learn to brake. Do this regularly. Use both brakes. Unless your motorcycle is a relic, your brakes are far better than you think they are. No “toss you over the handlebars” myth applies, I swear to you. Front brakes apply the majority of your bike’s braking force, so use them. Learn to make your tires howl without breaking contact, and learn to love that sound. Learn how fast you can brake without skidding. Learn to ride out a skid that does happen. If you have ABS, engage it on purpose to learn what it does, how it sounds, and where it engages so that it never surprises you. Knowing how to stop your motorcycle is just as important as knowing how to make it go fast, and someday, when that SUV enters a rotary, unexpectedly, right in front of you, you won’t be picking up pieces of your bike in the road. You’ll be cursing that ignorant driver and continuing on your ride, none the worse for wear. Okay, your brakes might be a little warm. Relegate that “lay ‘er down” myth for the ages, and don’t let your friends get away with it either. Anyone who insists they had to crash on purpose is just admitting that they’re a bad rider.